The Pool is another wonderful family opportunity offered to the Elks. Membership is available to Elks, Elk spouses, Elk widows or widowers, Elk dependent children under the age of 21, and Elk grandchildren under the age of 21. Unmarried Elks are entitled to one guest card with the name of the guest on the pass. Additional Elk Guests ~ $7.00 per person (Guests must be accompanied by Elk at all times). 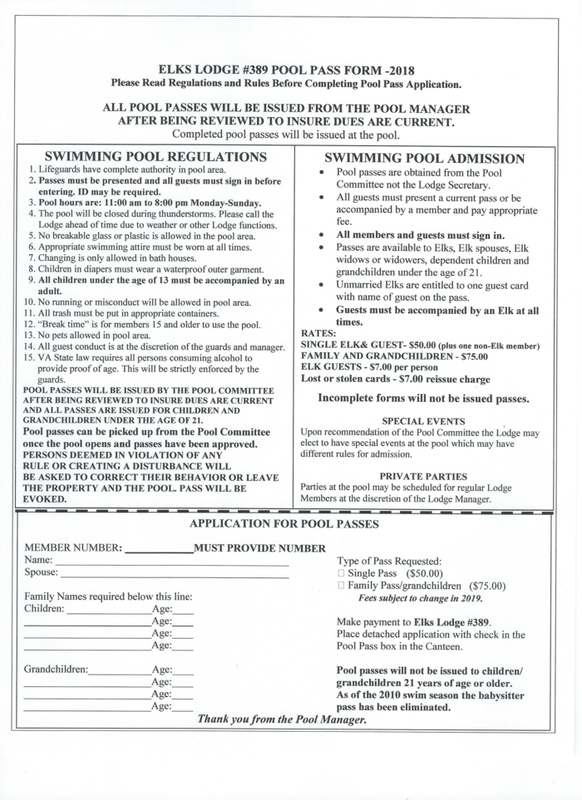 You may apply for membership by completing the form and submitting it to the Pool Committee. After the form is reviewed it will be verified for current payment of Elk dues. The 2018 Pool hours are 11:00 am - 8:00 pm Monday through Sunday.